It rained hard early Friday, then cleared throughout the morning and turned into a nice day. I got out on my bike late in the afternoon and rode up Grizzly Peak Boulevardto the top of the hills, then stayed up there, riding south toward the Oakland hills. The weather had turned threatening, but the filtered light through the gathering storm clouds was muted and striking. Within about 10 minutes of this shot, a heavy shower passed over. I got to my turnaround point and started riding back north. 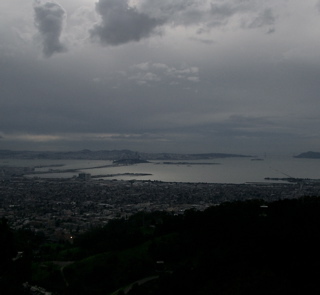 By this time, a big area of rain was sweeping across the bay. I realized I probably wouldn’t get back home before it came over. On the last hill before the long coast back into town, it really started coming down. I was wet already, but not soaked through, so I stood under some eucalyptus trees (not on the top of the ridge, so safe from lightning, I was pretty sure) and watched as the rain, with a little hail mixed in, poured down harder and harder. After five or ten minutes, the rain slackened and I continued up the hill. Water was sheeting across the road all the way up the hill and on most of the streets during the six-mile-plus descent. I was wet through by the time I got home. Riding in the rain — you are back!